The historic cotton mill village of Glencoe, NC was founded in 1880 on the Haw River. The mill was so remote at the time that the mill owner built housing for his workers, as well as a store, a barber shop and churches. Through the years following the mill’s closure the Victorian cottage houses were allowed to deteriorate (note the photo above) but most are still standing today. 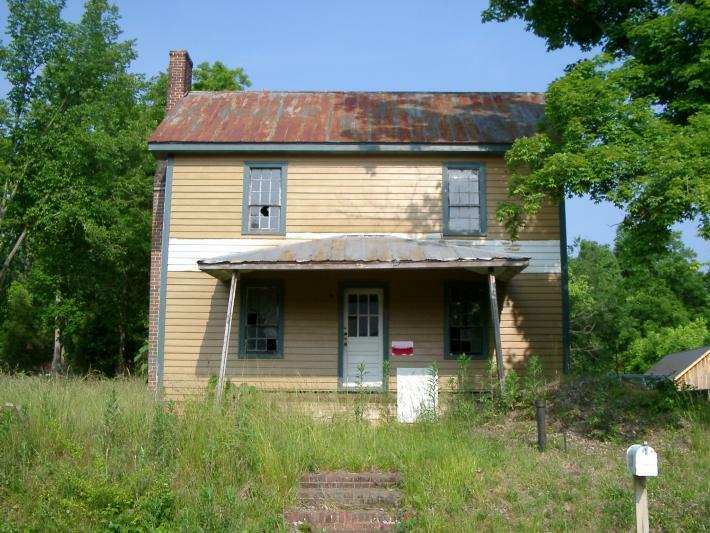 Just recently, Preservation North Carolina bought the property and has subsequently sold the individual houses to people who have pledged to restore them to their original condition. Many have taken up the challenge and the village is returning to life. The covenants for restoring the exteriors for most Historic District properties are uncompromising as they simply must be restored to their original Victorian cottage look. But the renovation parameters for Glencoe are so restrictive that even the existing interior finishes and millwork ( doors, trims, etc.) can not be altered except by paint. 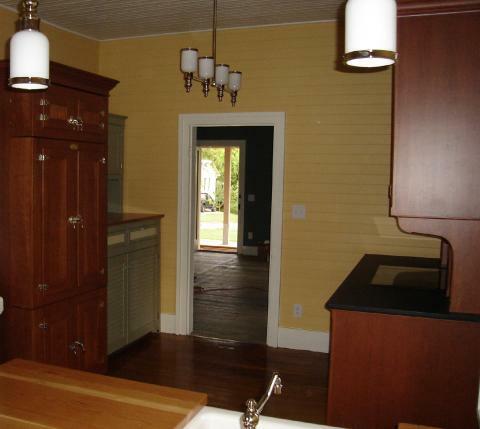 Designing a modern kitchen to look like an 1880’s Victorian cottage kitchen was a challenge for the intrepid new owner. Concealing the modern appliances was a major concern, as was continuing the original idea of placing furniture in the room instead of installing built-in cabinetry. In addition, the room had to accommodate a breakfast table and the laundry facilities. Finally, after searching for appropriate solutions, YesterTec’s Kitchen Workstation Furniture was chosen to do the job. Though the room is only 17’ x 11’ with 2 doors and 3 windows (that could not be moved or altered),YesterTec’s workstations conceal the refrigerator, washer, dryer, dishwasher, oven and microwave, leaving only the cooktop exposed. 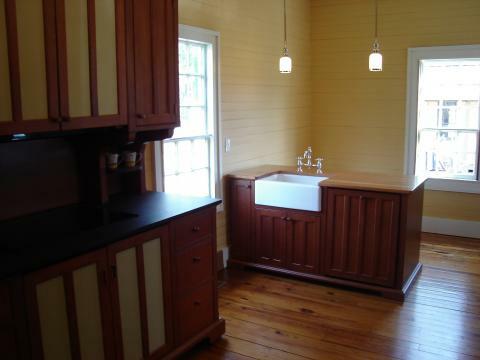 In addition, an apron front sink and wood and slate counter tops were used to reflect the style of the period. Because the base and door trims could not be removed, and the walls and floor were far from square, using furniture instead of cabinetry was a very good choice. Across the room is the Range that conceals the GE wall oven and microwave/hood behind flipper doors. This piece utilizes YesterTec’s U.L. Listed technology that allows the appliances (including the cooktop) to operate only when the flipper doors are stowed in their pockets, exposing the appliances. 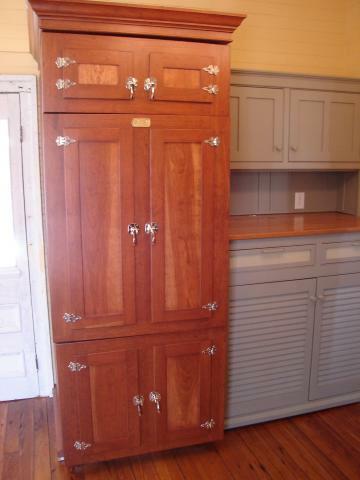 The refrigerator/freezer is a standard GE top/bottom door model that is enclosed in a cherry cabinet that resembles an old fashioned ice box, complete with all the reproduction nickel hinges and catches. The wood door of the ‘Icebox’ is directly attached to the refrigerator doors, eliminating the need to open two doors in succession. Directly adjacent is a muted green painted cabinet with louvered doors that conceals the Bosch washer and dryer. The sink workstation conceals a KitchenAid fully integrated dishwasher. The range and sink workstations are extra deep, creating more storage and countertop space than normal two-foot deep cabinets. This is the major reason why so few workstations were required to create this extremely efficient kitchen. Note: The photos shown here depict a ‘work in progress’, but just about finished. Check back with us to see the kitchen when it is completed. For background info about the village of Glencoe, please visit http://www.glencoenc.com/. 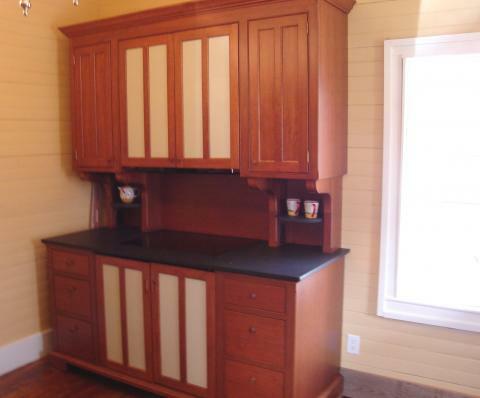 Next ArticleA Furnished Kitchen is an Asset when its time to Sell! Previous ArticleConcealed ovens…An exciting new design option!